I have to have a pan of my own. I need something I can grab when I'd like a quick snack or meal, those times when I want to cook one veggie burger, one sandwich. My partner uses his for two or three eggs. It is the kind of pan you can use and basically wipe clean -- quick to cook, no hassle. 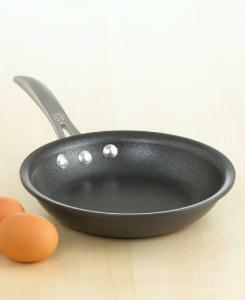 This eight-inch skillet is not just a perfect size; it is one of the prettiest little skillets I've ever seen. It has smooth rounded edges and a pleasantly curved handle. The design makes flipping without a utensil so easy that anyone can do it. Calphalon applies four interlocking layers of nonstick to the interior, so you can toast a nice cheese sandwich to a golden brown without the cheese burning to the bottom. Choosing an eight-inch skillet can also help with portion size. It is just right for a double serving of vegetables or a single serving of protein. The nonstick helps cut down on butter or oil. And when I indulge in pasta, extra hot and covered in melted butter, it gets the pasta sizzling, releases it easily, and prevents me from eating so much that my stomach hurts later. Add the Calphalon One Nonstick Skillet to the set as well. This one even comes with a lid.